– Mr.C toddles into my room and today he’s not in the mood to snuggle so tells me “momma up”! I will never tire of waking up to my son’s smile. – Breakfast is sausage and eggs. Mr.C tells me “watch” so we drag a chair to the counter next to the stove to accommodate. He does well and thankfully doesn’t even reach to try and ‘help’. – I attempt to convince him to take a nap. He is NOT tired, no eye rubs, full of energy even after reading three books in his bed. I decide not to fight and let him watch a movie hoping he will pass out. He chooses from our vast selection of 12 DVDs ‘Brave’ (no surprise since we watched this at least 10 times in our 5-day visit to H’s house…thank-goodness we don’t have Wreck-it Ralph, not sure I can watch that one again for awhile). I admit this is laziness on my part, and would be a terrible way to do business day-to-day… luckily I have daycare during the week or I’d have to learn to get strict about it. 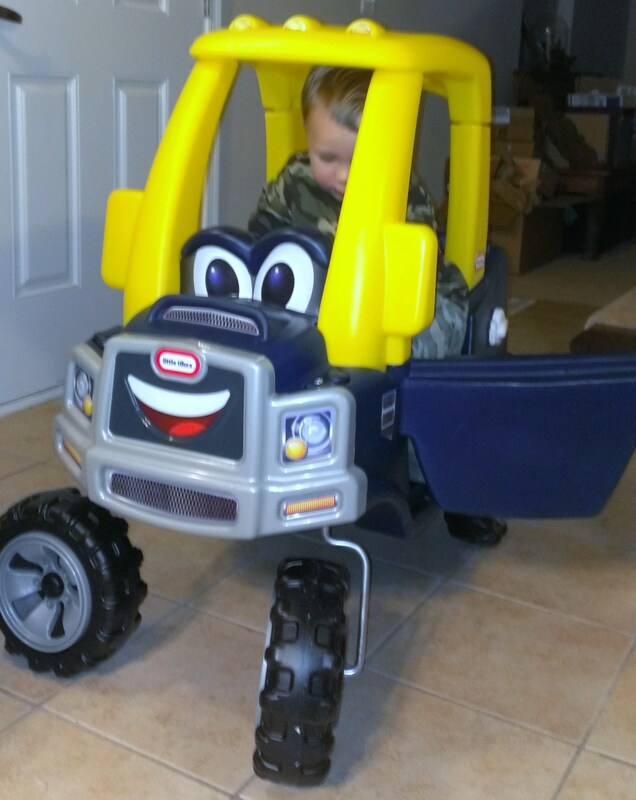 – C gets restless about an hour into the movie so we take the new truck riding toy Grandma sent for Mr. C’s birthday outside (I am so proud of myself I put this thing together and it came in a million pieces). It seems to work best when harnessed to Diamond, and we make stops to roll hot wheels down the playscape slide and to watch the big kids play a game with a racquetball in the street. – I call H when we get back. Mr.C seems happily engaged drawing on the small dry erase board we have on our fridge so I think I can multitask. 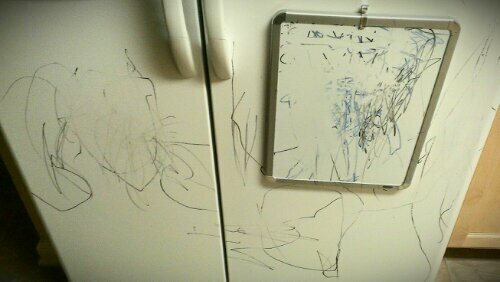 When I look up and see the entire fridge has become the canvas, no problem…when we start moving to other surfaces the markers are confiscated. In protest Mr. C decides to play with the trash can which he knows is off limits. I have to hang up when he refuses to stop trying to open the lid with his mouth…GROsS. – Mr. C asks to watch the “moomie” again. About 15-min in he’s sound asleep…this is nice because I can make dinner and do the dishes without interruption (and watch a show on my kindle fire hd) but I know its gonna hurt later. – I wake Mr.C up about an hour later to eat dinner… it’s also an hour before we usually start our bedtime ritual and so I know it’s either do this now and suffer or don’t do it and get up at 3am. He is NOT happy to be awake and proceeds to try and cuddle for about 30 minutes with no interest in eating. – Daddy decides he just needs to go back to sleep, which seems logical, so he takes him up for bath. Not only is Mr. C not happy about this, his protest is likely heard across the neighborhood. I eat my dinner as fast as I can and clean up the kitchen then head up to take over. – I find Daddy is being soooo patient with a squirming, screaming, naked child as he tries to get him in the bath. I take over, and the bath soundtrack is entirely yelling and crying. We get it done quickly, into pajamas, and the yelling finally stops when I show him the new childhood pictures of his Dad I just found in a box. – We read about 5 book, and play with puppets for a bit, then he finally settles down enough to stay in bed after everyone in the house and all the toys get a kiss from the mouse puppet. I lay with him for about 15 minutes then leave, locking the gate behind me. He actually does very well tonight (we are 5-days into sleep training) and although there are a few random cries I pretty much only hear his talking toys (Scout and Jingle) until he falls asleep at 8:15pm (but it feels like it’s 11:30pm).